A white Christmas is all well and good (especially here, where it is so rare – only the second one I have had in my life.) However, when a ‘40 year’ storm socks us in for about two weeks, it does have some implications. For the last while I have had incredible difficulty getting outside where I can practice my Tae Soo Do forms and work with weapons. I am intending to test for brown belt this January, and I need to have all my previous forms polished up and my staff form completely down. Have you ever tried to swing a staff that is taller than you are in a house with low ceilings? It doesn’t happen. To be able to move with a staff, there must be enough room. The outdoors (or a gym) are necessary. It is decidedly not a close quarters weapon. I had my first proper practice again yesterday. It is above freezing again, an after the snow was removed from the driveway there was no slipperiness or ice. 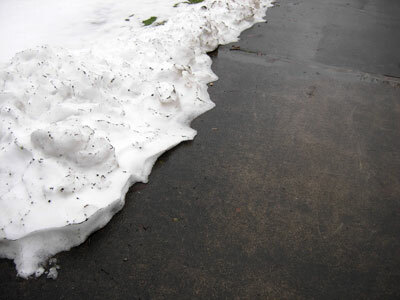 It remains strange, though, to see the drifts of slowly melting snow that are still lying everywhere you look. This entry was posted in Ordinary Life on December 28, 2008 by Allison. Today I rummaged in the garage and opened up the disused lower hutch drawer, gathering all my seeds, some packets of them as old as 2005 vintage. I laid them all out on the floor and figured out the dates to get them started and made my initial schemes for the growing season. In many years past, I have struggled to get a garden going. For the last four springs, I have been in the dorm at my Alma Mater, Multnomah Bible College (now Multnomah University). This has given me… limited resources, to say the least. Additionally, I am not terribly fond of deadlines. Thus, I have often waited longer than I ought to to get going on time-sensitive tasks. I’m hoping that setting a schedule this year will tap into the list making, planning side of my personality and keep me on track. I really want to have a riot of color come summer. This entry was posted in Ordinary Life on December 27, 2008 by Allison. Here’s a classic post from 2007. It was just a few days ago that I made my first attempt (ever) at transplanting just-sprouted seedlings from their germination baggies. It looked really traumatic. I do know that I need a different type of coffee filter. I could only find these special organic type ones, and the roots stuck like velcro. My hope is that the cheapo ones will work better for this purpose. I also need to pick up more of the correct size bags. I don’t know a good place to find them, however.